We knew it would come, but we did not think it would come this soon – an invitation to a slumber Birthday party for V’s friend. My husband and I looked at it and initially thought, no. Too risky. How can she manage on her own? What will she eat? She is supposed to bring a swim suit, so they must have a pool. That can throw a monkey wrench because CGM does not work when submerged in water. What if she has a bad low or the pod has to be changed in emergency? For sure everyone will go to bed really late, how will that affect her BG? She has been dropping at night/early morning lately, it’s a new trend and we haven’t figured out what to do with it. What if it happens again? Will the host even want to deal with all of our daughter’s medical issues? But then we thought about it some more. We knew the Mom and we did not have any general safety concerns. Their house was only about 3 miles away from our home, so we could get there very quickly if anything were to happen. 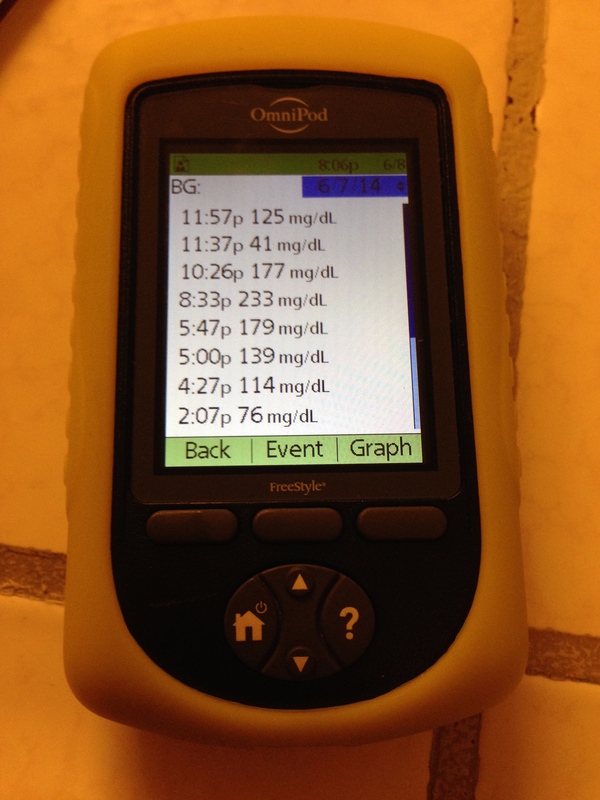 V is great at managing her blood sugar and diligent about checking for gluten. We can set a BG target a little higher to minimize the chance of lows. She can change the pod completely on her own, as she has done before. And her best friend Z would be there. She knows T1D and GF in and out and could offer just the right support. If the Mom was comfortable supervising V and we could make arrangements for food, it could work. I texted with the Mom back and forth, explaining her what V’s needs were and telling her that we would completely understand if she did not feel comfortable. However, she was one brave soul and said OK. It was our turn to be brave and say yes. V and I showed up at the door with GF pizza, cupcakes and pre-measured cereal for breakfast. I gave the Mom a brief show and tell of the gadgets and an overview of what to do in an emergency. I explained the gluten-free diet, that V could have all the veggies and cheese she wanted but needed to count carbs for fruit, and gave an overview of what she could and could not have. (Waffles, no. Bacon, yes!) I could tell, however, that most of the info went over this Mom’s head, understandably. We cannot expect anyone to really grasp much of what to do, it’s more about knowing when to call us for help. 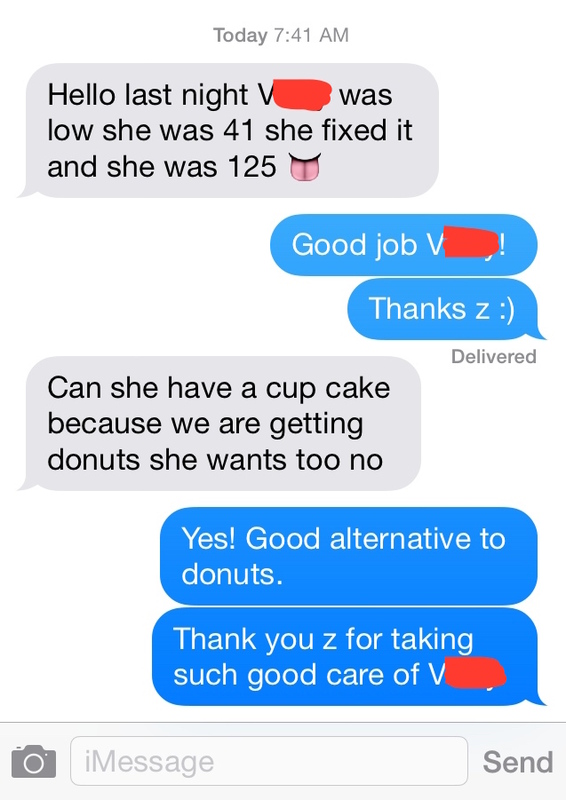 When Z arrived, we were able to hook up her iPod to the Wifi so that the girls could text or FaceTime me if needed. I stayed for a couple of hours while V swam in the pool, monitored her, settled her in. And then I took a deep breath and left my 9-year-old child in charge, with clear instructions to keep in touch and call or text anytime she had a question. I did not hear from V for a couple of hours. She texted me before dinner and her BG was pretty good. We chatted briefly around 10 PM, everything was going well. They were about to watch Frozen. We said good night and I went to sleep with the phone by my side. I woke up a couple of times and checked it to make sure I did not miss a call or a text. I heard nothing until morning. 41! I think that was her record low. Oh dear. But…she managed it well. When I looked at BG records later I saw that V did indeed do a good job of testing often and taking good care of herself. She also later told me that when she tested at 41 she was feeling very tired and falling asleep (at 11:37PM!) but Z helped her to stay awake long enough to re-test and make sure her BG was back in the safe range. Life is so much better when your child has an amazing friend. Every child should have someone like Z in their lives. Well, LOL! That’s what happens when you eat a cupcake and cereal for breakfast. But it was a special occasion to it was OK. Between breakfast and pick-up time, everyone managed to get back into the pool again. And… nothing bad happened 🙂 Our daughter had a blast and was able to participate in everything from swimming, to decorating cupcakes, to snacks and pizza, to staying up very late watching movies with everyone else. When I picked her up all of the adults told me how amazing she was at taking care of everything. She is amazing and I was doubly thankful that her friend Z was there for added support. One more hurdle overcome. Move over T1D and Celiac, life goes on and we learn how to live it well no.matter.what. It’s a math test, no it’s a science test, no it’s a camp form! Do your kids go to camp? I imagine there is all kinds of paperwork to fill out. 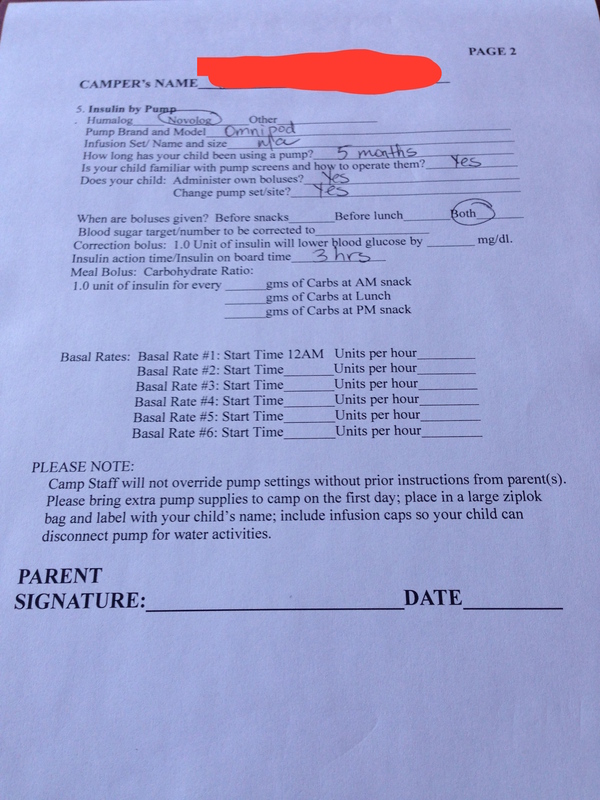 I sat down to fill out paperwork for V’s Diabetes Camp. I was plugging along just fine, writing down contact info, emergency info, doctors’ names and phone numbers. And then got to this form, asking me to fill out all the info on the pump. Instantly I felt like I just started a final exam. I was staring at the questions, my mind going blank, feeling like I had no idea what they were asking me. But it’s something I should know, right? Looking at it again, they did look familiar. So I must know it. I re-read the questions and things started to come back little by little. Just like on a test, I deployed the true and tested strategy of finding a question I could answer right away. When are boluses given? I know this! ALL the time. Easy. Next: BG target. Shoot, I should know it. I think I know it? It’s 130 during the day and 150 at night, right? Have to double check but let’s move on and see if there is an easier question. Next: Correction bolus. *&^%$#@! Do not remember the numbers, have to come back to it later. Next: insulin action time. I KNOW this one too – 3 hrs. Yeah, another easy question! 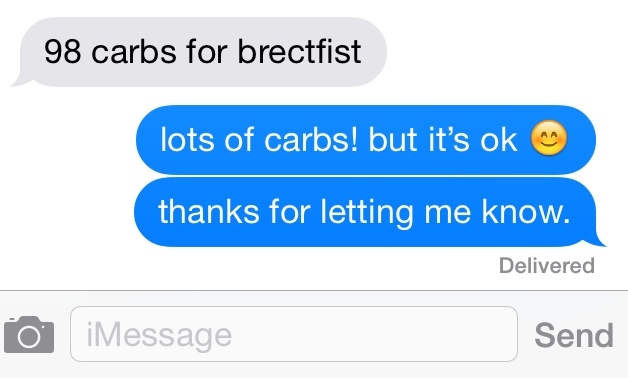 Next: Carb ratio. Here’s another one I should know but do not have memorized. Will come back to it later. Basal rates – HA! These I can recite with ease, anytime, anyplace. After answering the questions I knew, I got the paperwork from our last Endo appointments and filled in the rest of the numbers. I am pretty sure that at the end I aced the test. Success!